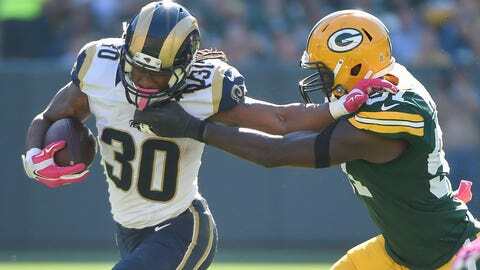 Todd Gurley rushed for 159 yards against the Packers before the Rams' bye week. ST. LOUIS — The last two games, Todd Gurley has 305 yards rushing. 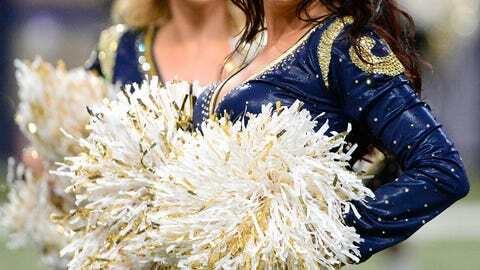 Just wait, St. Louis Rams coach Jeff Fisher says, until the rookie is 100 percent. The 10th pick of the draft appears ahead of schedule coming off left knee surgery that cut short his final college season at Georgia. He’s wearing a brace in games to protect the knee, but that hasn’t been a hindrance, judging from the production. "I mean, I’m fine," Gurley said after practice Wednesday. "I’m pretty sure 100 percent of the guys in the NFL are not 100 percent and I’ve been doing fine so far. Just got to stay on top of things." In a conference call with reporters in Cleveland, this week’s opponent, Gurley said he can do everything he could before getting hurt. He said there was plenty of room for improvement across the board. "I’ve seen plenty of guys come back from this injury," Gurley said. "I felt like I didn’t have any problems, that I should be able to come back and play." Fisher wouldn’t place a percentage on Gurley’s health, but said it was prudent to protect the ACL. "You look around the league, it takes more than just a year to come back," Fisher said. "Todd’s a year out, that’s why I say he’s not 100 percent. He’s going to continue to get better." Gurley is rested coming off the break after getting heavy duty in a loss at Green Bay, gaining 159 yards on 30 carries. During the bye week, he attended the Missouri-Georgia game in Athens and didn’t feel like he should be out there. "My days are done," Gurley joked. "I play on Sundays now." "Ideally, we’d like to have the one-two punch and over time, get Tre a lot more touches," Fisher said. Gurley said he was "definitely surprised" to be doing so well so soon. But he added, "I’m definitely confident in myself and know what I’m capable of." "Had he been available," Pettine said, "it certainly would have been in the discussion." The Rams (2-3) will be playing a team that’s last in the NFL in rush defense. The Browns (2-4) surrendered 98 yards on 10 carries to Tennessee’s Dexter McCluster, 139 yards and a touchdown to Oakland’s Latavius Murray, 121 yards to Baltimore’s Justin Forsett, and 111 yards to Denver’s Ronnie Hillman. Cleveland has allowed 149.8 yards rushing per game with a 5-yard average and is 30th in overall defense, giving up a 26-point average. Fisher and Rams players say they won’t be guilty of overconfidence. "Those things sound good," Gurley said. "Those guys can come Sunday and play like they’re the No. 1 defense." NOTES: The Rams have reunited rookie offensive tackle Rob Havenstein and guard Jamon Brown on the right side after separating them late in the preseason to prevent teams from taking advantage. Veteran Garrett Reynolds, who replaced injured Rodger Saffold at right guard last week, will start at left guard. "It can get confusing at times," Brown said, "but I think I do a pretty good job with it." … Cornerback Janoris Jenkins was limited with a concussion, one of four Rams starters who did not practice. Defensive end Robert Quinn (knee), wide receiver Tavon Austin (hamstring) and tight end Lance Kendricks (finger) also were held out along with Mason. Kendricks could miss at least one game after undergoing surgery last week for a torn ligament. Defensive end Chris Long (hyperextended knee) also was out from an injury against the Packers and is expected to miss a few games.